In the last of the qualifying rounds of the League Cup, Penicuik Athletic travelled to Prestonfield to play Linlithgow Rose who had only managed a single point from both their previous games. However, they started with all guns blazing and when McIntosh lost possession just inside his own half, Smith took full advantage to set up Watt who slotted past Cordery in the third minute. Rose were well on top and Penicuik were pressed back in defence and a poor kick out by Cordery gave possession to Linlithgow. MacLennan picked out Coyne, but Cordery saved his shot. Immediately afterwards Cordery again came to the rescue for Penicuik with another good save. Penicuik weathered the storm working their way back into the game, and in the 31st minute, Baptie dispossessed Urquhart and raced up the left wing. He then curled the perfect cross into the box where Somerville dived in low to head home his fifth goal in three games. Five minutes later, a Sloan free kick was blocked by the defensive wall and the rebound was blasted high over the bar. At the other end, a driving run by Somerville saw his shot well covered by Marley. Just before half time, Connolly lost possession and Smith had a great chance to restore Linlithgow’s lead, but his effort went straight to Cordery. Three minutes into the half and Linlithgow were awarded a very soft penalty but Cordery saved Coyne’s spot kick. On the hour mark, another pinpoint Baptie cross picked out Somerville in the box, but the stand side assistant ruled him offside. Penicuik were the better side in the second half but neither team could get past the oppositions’ defence. 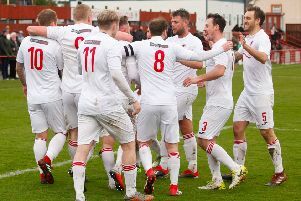 The only action of any note came in the 87th minute when Cordery saved a powerful Linlithgow strike at the second attempt. With a draw a fair reflection of the game, Penicuik won the section to progress to the next round and Linlithgow were eliminated from the competition. Penicuik boss Johnny Harvey felt his side weren’t at their best but most importantly they went through. He said: “We weren’t great to be honest. I don’t want to make excuses for that, but we were down to the bare bones. “We didn’t get to grips with the game and we didn’t look like we had the same energy as we normally do. Linlithgow Rose: Marley, Urquhart, Sloan, MacKenzie, McKinlay, Shields, Batchelor, Ruari MacLennan, Watt, Coyne, Smith. Penicuik Athletic: Cordery, Forbes, Williams (Sampson), Hume, Hamilton, Connolly, McCrory-Irving, Barr, McIntosh, Somerville, Baptie.